After struggling to make ends meet on her tomato farm, Cicily partnered with TechnoServe to start growing the more resilient Kilele tomato and implement best farming practices, allowing her to increase profits and open her own store. 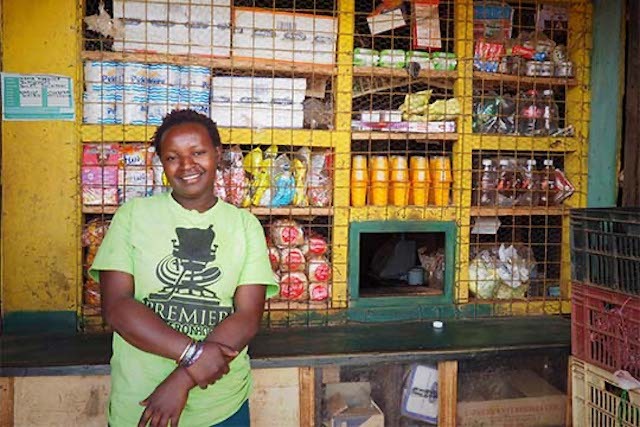 Cicily Makuma stands in front of her shop in Makuma, Kenya. At the end of a long line of one-story buildings is a brightly painted yellow storefront with “Wanyawira Retail Shop” etched above the entrance. From the street, the neatly organized stacks of bread, juice and washing powder are clearly visible. Seated out front in a blue plastic chair, sits Cicily Makuma, a farmer that is now venturing into her first retail business. Cicily first began farming after getting married and moving to Makengi, a village located in Kenya’s Eastern Province. She started off by growing tomatoes and green peas, selling her produce at the market in town. However, her tomatoes did not fetch high prices due to disease and poor quality. 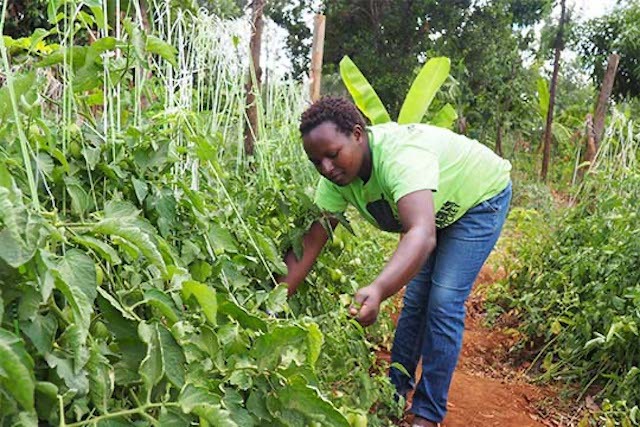 “I was doing farming on tomatoes, but I wouldn’t get good yields and I didn’t know how to take care of my plants in nutrition and to protect from diseases,” she said. 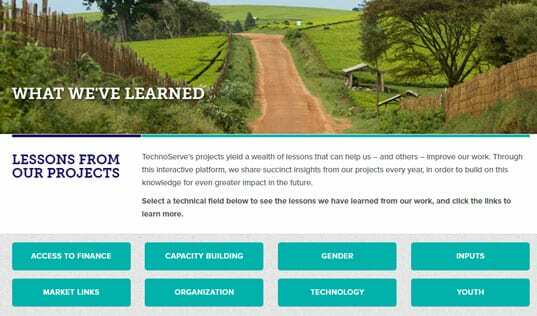 In April 2015, Cicily joined Mavuno Zaidi, a partnership between TechnoServe and Syngenta that aims to increase the incomes of 15,000 smallholder tomato and potato farmers in the Rift Valley and Eastern Kenya via improved input use, adoption of good agricultural practices and improved market access. Cicily tends to the Kilele tomatoes she planted as part of the Mavuno Zaidi program. Through Mavuno Zaidi, Cicily attended interactive agronomy trainings where she learned about seven crucial elements to successful tomato farming, including nursery preparation, land preparation, transplanting, weeding, crop protection, staking and post-harvest techniques. Cicily shared that one of the most influential trainings focused on the proper fertilizers to use and best practices for crop protection. TechnoServe also introduced farmers participating in the Mavuno Zaidi program to a new variety of hybrid tomatoes, called Kilele F1, which were provided by Syngenta. Kilele F1 is suitable for dryer areas, has a firmness that increases its transportability and shelf life to over 21 days, and produces more tomatoes over a longer period of time. It has a smooth, shiny skin and an elongated shape that makes its appearance attractive to customers, thus increasing its marketability. The Kilele hybrid is estimated to yield three times the yield of nonhybrid tomatoes, producing 30 to 35 tons of tomatoes per acre, when paired with good agronomic practices. And the tomatoes can be picked for 10 weeks, as compared to the average four weeks of non-hybrid tomatoes. 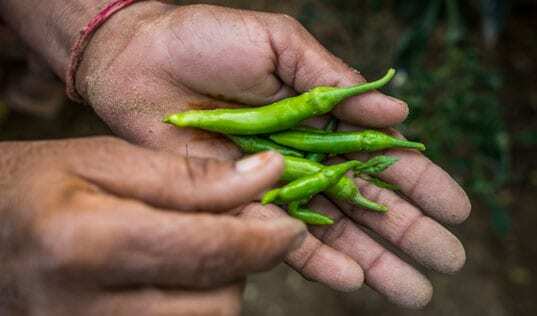 This hybrid variety is also resistant to diseases that plague tomato plants, including tomato leaf curl virus, tomato mosaic virus, verticillium and fusarium wilt, and nematodes. 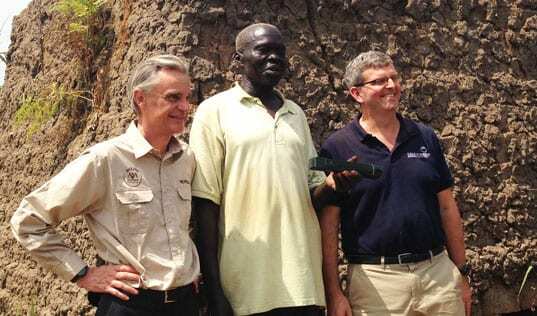 With the new variety of tomatoes planted, Cicily’s tomato plants are now producing 5 kilograms per vine, a 250 percent increase over her previous yields, and her harvest season has extended from three to eight weeks. As a result of this increase in production, Cicily is now harvesting 120 crates of tomatoes as opposed to 20 crates, while improvements in the quality of her tomatoes has increased the price of each crate from 800 shillings to 1,500 shillings. With the profits from her tomato business, Cicily has been able to purchase a power saw for cutting wood and a cow to produce milk for her family’s use. But Cicily expressed that her biggest accomplishment has been opening a shop in town where she sells popular goods to members of her community. She opened the shop in July of 2016 for $387, and is now making more than $48 per day in sales from the shop, which results in a profit of $145.35 per month. She also no longer has to travel to the market to sell her produce, choosing instead to sell it to her loyal customers at her storefront. “I am doing fine in life now. I’ve been able to move from village to town. And I am able to feed my family from this shop,” she said.